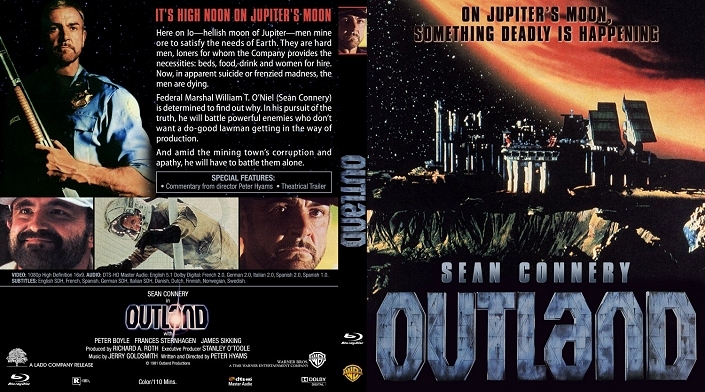 This week guest host Mark (M-5) looks at a somewhat more recent classic Sci-Fi film called “Outland” from 1981. Here are some comments from the man himself about this movie. This is Mark Daniels from the Great Pacific Northwest. I’m back this week with another classic science fiction movie. Normally I would take a look at a classic movie from the 1950s or 1960s. Today I’m going to take a look at modern classic science fiction movie. It’s “Outland” from 1981. It stars Sean Connery, Peter Boyle and Frances Sternhagen. Outland in one of these underrated science fiction that always seems to fly under the radar. Some would call this movie a western in space. Whatever you want to call, it’s great movie and Sean Connery is the man! Thanks once again to Mark for another cool podcast. I’ll be back next weekend with Chris & Meds as we discuss the most recent series (or season) of “Doctor Who.” Take care until then and enjoy your week. Glad to see someone else appreciates this movie as much as I do. Nice podcast. I would have picked Jerry Goldsmith as my Star Trek connection. His sci-fi and fantasy scores are many of my favorites.